^ Woolf, Nicky. David Bowie's Will Detailed, Ashes Scattered in Bali. The Guardian. [2016-05-07]. 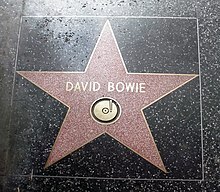 ^ David Bowie. Rock & Roll Hall of Fame. ^ Legendary Artist David Bowie Dies at 69. The Hollywood Reporter. 2016-01-10 [2016-01-11]. 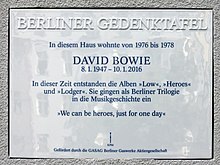 ^ How to say: Bowie. BBC. 2008-01-08 [2010-09-16]. ^ Buckley, David (2000) [First published 1999]. Strange Fascination – David Bowie: The Definitive Story. London: Virgin. ISBN 978-0-7535-0457-4. ^ Thompson, Jody. Sixty things about David Bowie. (No. 35): BBC News. 8 January 2007 [2010-09-17]. 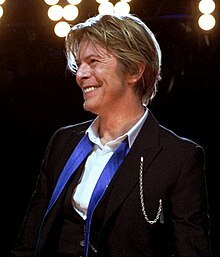 ^ David Bowie turns down knighthood. music-news.com. 18 April 2015 [2016-01-11]. ^ 15.0 15.1 李子凡. 搖滾變色龍 大衛鮑伊69歲癌逝. 香港蘋果日報. 2016-01-12. ^ From Vatican to outer space, tributes flood in for David Bowie. Reuters. 2016-01-11. ^ 搖大衛鮑伊曾開口唱中文歌《剎那天地》 歌頌西藏自由. SCMP南華早報. 2004-02-13. Buckley, David. Strange Fascination — David Bowie: The Definitive Story. London: Virgin. 2000 [First published 1999]. ISBN 0-7535-0457-X. Buckley, David. David Bowie: The Complete Guide To His Music. Omnibus Press. 2004. ISBN 978-1-84449-423-1. Buckley, David. Strange Fascination — David Bowie: The Definitive Story. London: Virgin. 2005 [First published 1999]. ISBN 978-0-7535-1002-5. Buckley, Peter. The rough guide to rock. Rough Guides. 2003. ISBN 1-84353-105-4.